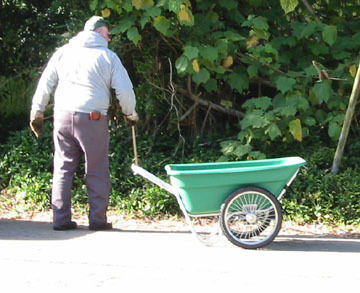 While the Cushman cannot be driven up the steps, it presents little challenge for a wheelbarrow. As I'm sure you remember, our volunteers are well versed in forming bucket brigades to move large amount of soil, stone, and plant material into and out of area inaccessible to vehicles. Even the new carts used by park staff cannot climb steps. And for Park staff to have to arrange a work "Party" to form a bucket brigade to simply do their job is ludicrous.